Take a trip to China and discover the rich cultural background of this unique land. Click here to play! Take in all of the sights while you spin these reels for a chance to experience China and win a few extra bucks! 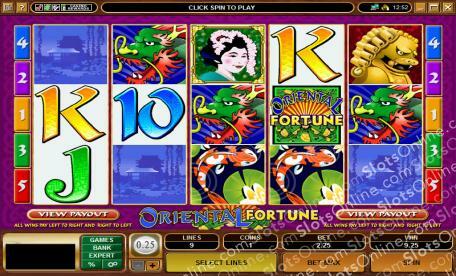 The Oriental Fortune logo is your ticket to this adventure. Spin three to five of these symbols to bring in the top prize of 5000 times your line bet. Watch out for the iconic Geisha while you're touring the land. This delicate lady is a wild and will substitute for all other symbols to help you spin in more wins. You'll also want to watch out for mythical creatures such as golden lions and dragons. Spin three to five of each to win up to 3000 or 2000 times your original line bet. You're bound to see plenty of beautiful Chinese gardens with ponds full of coy fish. Spin three to five of this graceful fish across an active pay line to get up to 700 times your line bet. Don't forget the pagodas. These traditional houses will get up to 600 times your line bet. Travel to the farthest reaches of the eastern world for a chance to see plenty of iconic sights and plenty of big wins! The lovely Geisha acts as a wild symbol and will replace all others to help you bring in more wins.